Creating a customer centric culture is essential to businesses of all sizes today. And being customer centric means the entire organization must be aligned. The challenge and opportunity to leverage disparate sets of information into strategic action is a shared responsibility and priority across the board. That is why creating a customer centric culture should be on top of everyone's priority list across the organization. In this presentation, John will provide attendees with a behind the scenes view of how AT&T is blending people, processes and new technologies like social media, to improve its own B2B customer experiences. Tips on ways to link various touch points in the LEARN-BUY-GET-USE-PAY-SERVICE Customer Continuum will be shared. In addition to AT&T, the following companies will also share their inside stories on Measurement & ROI, Data Performance, Operational Metrics and Social Media CRM. Kelley Blue Book, CVS Caremark, Verizon, AAA Northern California, Rockwell Automation, J.D. Power & Associates, Maritz Research, CPI Card Group, Customer Experience Partners, Customer Bliss, EMC, Forrester, Expedia, Allstate Financial, Peppers & Rogers Group, Pfizer, FedEx Corporation, GE Healthcare, Microsoft Corporation, and more. Much discussion takes place on the nature of the audience when discussing customer experience - is it business-to-consumer or business-to-business? The answer is, it's both: every customer is a real, live breathing person - a consumer who ultimately seeks out experiences that engage his time rather than waste it. In the Experience Economy, many approaches once reserved for the B2C space have migrated to the B2B space as companies realize they are selling to business professionals who are ultimately "consumers." In this presentation, Joe Pine will show you how to create economic value from the experience you create for your customers, featuring examples from many industries that go beyond good and services to staging economic experiences. He will also focus on the increasing use of digital technology, which can make such experiences more efficient and engaging. He will in particular show you how to embrace digital technology in such offerings, creating experiences that fuse the real and the virtual. Joining Joe at the one event focused on Measuring, Aligning and Communicating Strategy to Ensure Business Relevance are leaders from: Kelley Blue Book, CVS Caremark, Verizon, AAA Northern California, Rockwell Automation, J.D. Power & Associates, Maritz Research, CPI Card Group, Customer Experience Partners, Customer Bliss, EMC, AT&T, Forrester, Expedia, Allstate Financial, Peppers & Rogers Group, Pfizer, FedEx Corporation, GE Healthcare, Microsoft Corporation, and more. Download the brochure to see the full program. 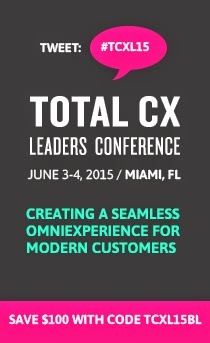 The Total Customer Experience Leaders Summit is the ONLY comprehensive forum for B2B and service oriented B2C leaders to come together for a high level exchange around the issues that matter most. Register by June 24, 2011 & Save $500 off the standard & onsite rate. Register with code TCEL11BLOG here. In association with Citrix, The Institute for International Research invites you to join us for a one hour complimentary Web Seminar. When it comes to social media, there's no single "right way" to use it for business. Within its channels companies of all sizes can engage with prospects and customers to drive sales and provide services in a variety of ways. What matters, however, is that the social media experience your business provides be consistent across the board. A holistic approach is the key to a successful social media program. Join industry expert Alex Beauchamp to understand the many components of social business and learn how to put them all together into a cohesive plan that best reflects your organization's personality and value. Register Now. After registering you will receive a confirmation email containing information about joining the Webinar. This web seminar is sponsored by Citrix. Citrix Online provides secure, easy-to-use online solutions that enable people to work from anywhere with anyone: GoToMyPC® for remote access, GoToAssist® for remote support, GoToMeeting® for online meetings and GoToWebinar® for larger Web events. A division of Citrix Systems, Inc. (Nasdaq: CTXS), the company is based in Santa Barbara, California. What Do Your Digital Customer Experience Strategy Look Like? This recent post on Mashable by Ron Rogowski of Forrester Research points out some important reasons that brands need to have a digital customer experience strategy in the current market to stay competitive. Start with company and brand strategy. Describe the intended digital experience. Direct activities and processes that support the defined experience. More than just a website or a twitter handle, a digital customer experience strategy needs to reflect the overall brand strategy and directly support and reflect offline brand activities. Together, these elements add up to the real key to a successful digital customer experience strategy - seeing the digital world (mobile, social media and web) as holistic extensions of the brand. These digital touchpoints provide core moments to connect and engage with customers to create lifelong brand advocates. So what does your digital customer experience strategy look like? Looking to learn more about customer experience? Join us Oct. 3-5, 2011 for the Total Customer Experience Leaders Summit. Hear from the top B2B, and service oriented B2C companies on Measurement & ROI, Data Performance, Operational Metrics and Social Media CRM. Download the brochure here. Plus follow us on twitter for updated information at @TotalCustomer.